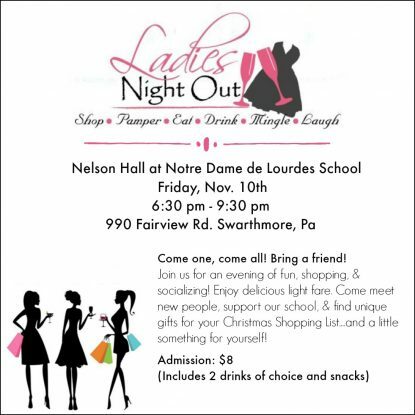 Notre Dame de Lourdes School (990 Fairview Road, Swarthmore) will host a “Ladies Night Out” on Friday, Nov. 10 from 6:30 p.m. to 9:30 p.m. The event will offer an evening of fun, shopping and socializing. Light fare, vendors and product demonstrations will be available, along with raffles for over 50 items and gift certificates. Attendees can also bring their silver and gold (such as old jewelry, flatware and plates) for purchase at the event. Admission is $8, which includes two drinks of choice and snacks. Proceeds will benefit Notre Dame de Lourdes School.